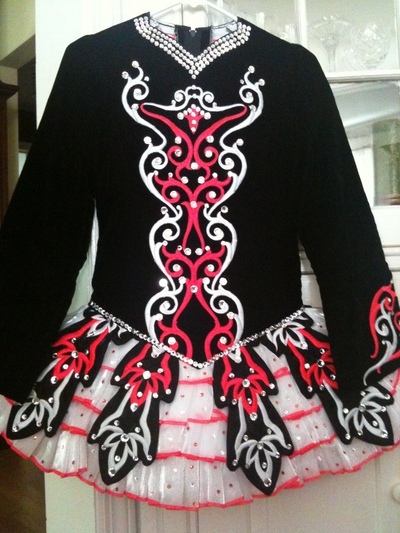 Nearly new Gavin Doherty dress for sale, made in June 2010 for the North American Nationals and only worn twice. Suitable for a petite dancer, worn by my 4′10″ u16 daughter. Black velvet bodice and sleeves embroidered in bright coral and white. White pleated ruffle skirt outlined in coral with soft black satin embroidered pieces on top. The dress is embellished with hundreds of clear and coral Swarovski crystals, and it comes from a pet-free, smoke-free home. Also included are a pair of coral bloomers and a coral crystal headband. About 1 inch let down. Asking Price: $US1750. Shipping costs not included. Returns are negotiable.